If you suffer from back pain or want to improve your posture, you should give inversion therapy a try. Inversion therapy has been around for decades, since at least the 70’s as a way to lengthen the spine and decompress the spinal discs in the back. The inversion tables we have reviewed as part of our top 10 best inversion tables of 2017, allow you to hang upside down and counteract the effects of gravity. All of the tables listed below, allow you to change the incline at which you will be inverted and can put you on a track to reducing inflammation and pain in your lower and upper back. The health mark promax inversion table, can support up to 600 pounds of body weight and has 6 preset angles to choose from. This table is a little unique in the fact that it allows you to be inverted in the traditional face up position as well as a face down position (which can be great for simultaneous back massages). So take the time to decompress your spine and give this inversion table a whirl. It’s a breeze to setup and use. The table itself measures 28 by 58 by 45 inches (W x H x D) and carries a one-year warranty, and can accommodate people up to 6 feet 6 inches tall. So while Shaquille O’Neal or the Jolly Green Giant won’t be able to use this inversion table, rest assured chances are it’s a perfect fit for you. If you are looking for a new frills, affordable inversion table that you can fold away and put in the closet or under your bed when not in use, then this is the inversion table for you. It can support individuals up to 300 pounds, and comes with a one year warranty. The unit measures 63″ (H) x 26.8″ (W) x 54.3″ (L) and can accommodate people up to 6′ 6″. Overall if you are just getting started with inversion therapy and aren’t sure if it’s right for you, then this can be an excellent table to try out and not worry about spending a fortune on an inversion table and finding out that it’s not right for you. 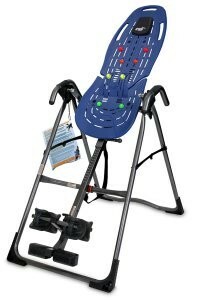 The Merax Inversion Table, is great to reduce back pain and improve flexibility all in an easy to control motion. The table features a dual-pin system that allows you to adjust the position, and supports individuals up to 6′ 3″. It also allows up to 180 degrees or full inversion while on the table, and is well constructed with plenty of ankle support and straps. 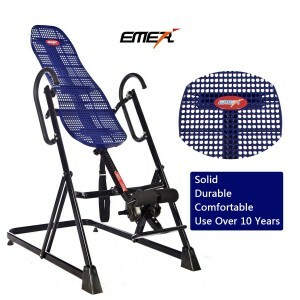 The Emer deluxe gravity inversion table, is constructed out of abs plastic and should last over 10 years. The frame is made up of tubular steel, so it’s structurally sound and well built. The table can support individuals up to 330 pounds and up to 6′ 6″. If you like the breath-ability of the abs plastic frame and are looking for a light weight inversion table, this is an excellent option. So what are you waiting for, reduce back pain and jump on this inversion table and find out what it feels like to hang upside down like a bat, you won’t be disappointed. 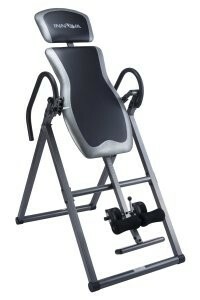 The invertio inversion table, can accommodate individuals up to 6′ 6″ in height and has 26 easy to use height adjustments. The unit has locking ankle support with 8 positions of adjustment. And the speed control with 3 position pivot joints, allow you to control rotation speed and allows for a full 240 degrees of rotation. The large padded head and backrest, means that you will be in comfort while using this table. Overall if you are looking for a inversion table that easily breaks down and can store away, this is an excellent option. 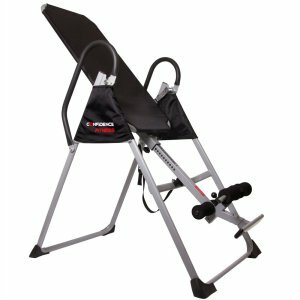 The body champ IT8070 inversion therapy table, is made of solid steel and can accommodate individual up to 6′ 8″ and up to 250 pounds. It’s an affordable table, that is built well, yet has most of the features you would want in an inversion table. The lockable feet and ankle supports are easy to get into an adjust and the loaded pull pin, allows for easy operation. If you are looking for an inversion table to reduce back pain and elongate your spine, then you should give this table a spin. The exerpeutic inversion table is a well built unit, with a strong steel frame and scratch resistant finish. It has a foam vinyl covered backrest and can accommodate people up to 6′ 6″ tall. The ankle release system, has a quick pull pin release, making it easy to get in and get going. 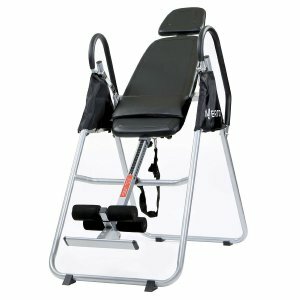 So if you are looking for an affordable inversion table, that is built well, then this is an great option for you. Just 5 to 10 minutes on this inversion table, can help reduce muscle stiffness, improve blood circulation and help to reduce lower back pain. 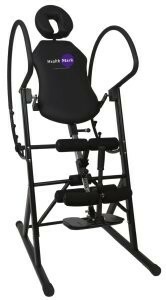 The innova ITX9600 deluxe inversion table, is made of heavy duty steel tubing and can support individuals up to 300lbs. The unit supports an extra long and wide back rest support and includes a unique 4 position side inversion pin, making changing degree’s of inversion a simple process. If you are looking for a way to relieve back pressure on your disks, improve blood flow and reverse negative effects caused by gravity, then this unit is perfect for you. 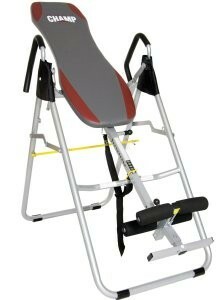 It’s a well built and solid inversion table, backed by a one year warranty. The Ironman gravity 4000 inversion table, is build from durable tubular steel and has 2.5 inches of thick memory foam covering the backrest for a comfortable head and back. The unit can easily be folded and stored away when not in use and is great for people with lower back problems. The ankles are easily locked into place, using a palm activated ratcheting locking system and can support individuals up to 6′ 6″. 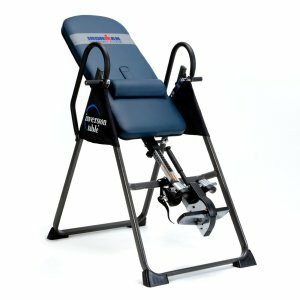 So if you suffer from back problems or are looking for a way to improve your circulation and range of motion, hop onto this inversion table and see why chiropractors have been recommending inversion therapy to patients for decades. Teeter is a well known brand in the inversion table sector and their comfortTrack series is the latest in there lineup to provide back pain suffers with a light weight, yet durable inversion table. The entire table folds down, so it can easily be stored under a bed or in the corner and out of the way. Their pressure reducing ankle supports are fabulous and comfortTrack bed is designed to maximize decompression, and flexes to accommodate body movement and comfort. The only thing this inversion table doesn’t have is a built in cup holder, but we’re told drinking liquids while suspended upside down is not recommended (trust us… three shirts later it looks like a toddler spilled their sippy cup all over our shirts).